I am Bohdan. 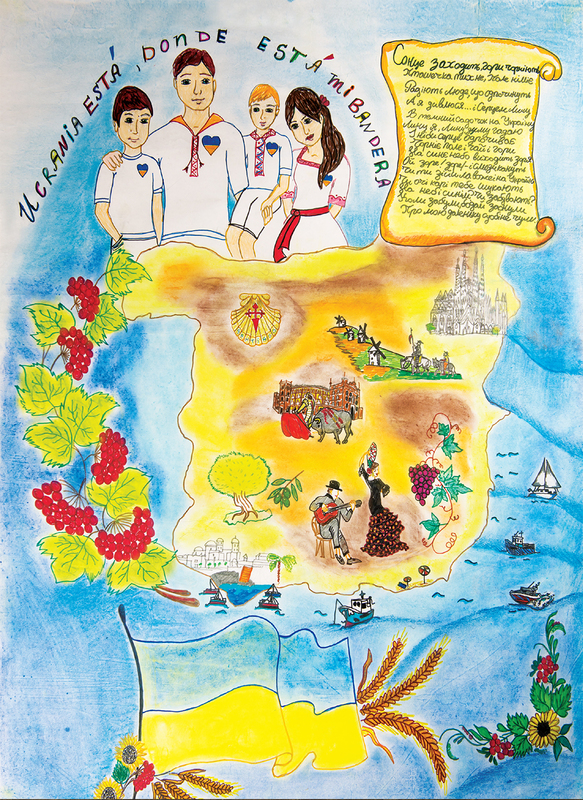 I am a Ukrainian, but was born and live in Spain because my par- ents came here to work from the beautiful, mountainous, and picturesque town of Kolomyia 16 years ago. As far back as I can remember, I always loved to paint. I paint when I feel good. When I am feeling bad, I hide my feelings on paper, too. Once I loved to draw animals, but now my passion is anime. Once a year we visit our relatives in my parents’ hometown. Now we have even live in Kolomyia for some time and attend the Ukrainian school. Teachers demand more diligence, discipline, re- sponsibility, good grades. It is not easy to study here; there is no way to be lazy! In Spain, my brother and I attended the Ukrainian Saturday school, so we can read and write in Ukrainian, but make many mistakes. Spain is a very sunny country. I painted it liked this. I also depicted the most famous symbols of Spain – Sagrada Família in Barcelona, a shell – the symbol of the Camino de Santiago pilgrim route, Seville – the birthplace of flamenco. I portrayed the corrida, the famous Spanish olives, Don Quixote, the white town of Cadiz, sea, ships of Spanish travelers. Spain is rich in wonders! May Ukrainians be similarly proud of their land, country and language! I wish that they preserve and respect the national symbols as well as share their culture with the world, as the Spanish do. We have much to be proud of!